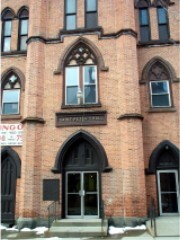 Following Mass each Sunday the parish hosts a free-will luncheon for parishioners and guests in the church hall, The Lyceum, across Fifth Avenue from St. Peter's Church. A simple but hearty meal of sandwiches, salads, beverages, and desserts is served. A light breakfast is also served after Mass on First Fridays! 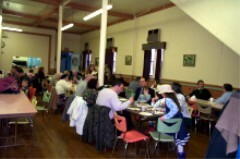 Speaking of Food: St. Peters Annual Corned Beef Dinner will be held on Thursday, March 13, 2003. Dinner will be served from 11:30 am-1:00 pm and from 4-7 pm. Volunteers are needed for this event. Please contact Tricia Gabriel at 272-9265 or Beth Thayer at 235-4379, if you can give a little of your time! See you at the Lyceum after Mass!